UPDATED: Fri., June 23, 2017, 3:09 p.m.
NASHVILLE, Tenn. – Rain bands reeling away from Tropical Depression Cindy spread drenching rains from the Southeast to the Midwest, triggering flash flood warnings over several states including West Virginia, whose residents on Friday marked the anniversary of deadly floods last June. The storms stretching for hundreds of miles are expected to push river levels higher in coming days as the remnants of a tropical storm cross Tennessee and Kentucky into West Virginia. The severe weather, which was blamed for recent coastal flooding in the Deep South, tornadoes and one death, is rumbling closer to the densely populated East Coast. 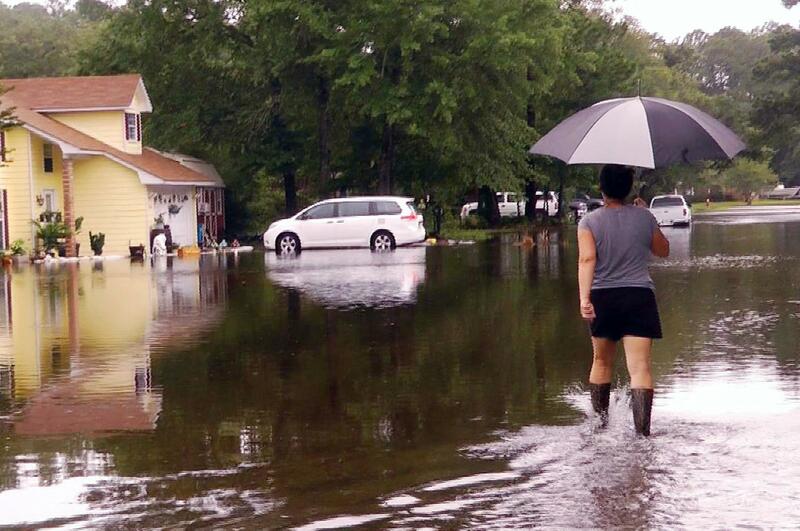 National Weather Service forecasters said rainfall totals of 2-4 inches were possible in several states, with up to 6 inches in isolated spots. Flash flood watches were issued for much of Kentucky and West Virginia. Last June, torrential rains in West Virginia claimed 23 lives and memories of that disaster remained fresh at somber ceremonies honoring the dead. A brief ceremony marking last year’s fatal flooding took place Friday at the West Virginia Police Academy in Dunbar, where a bell was rung 23 times, for each who died. U.S. Sen. Joe Manchin traveled to another community, White Sulphur Springs, for the dedication of a memorial for eight victims there. Labeled a 1,000-year flood by the National Weather Service, the storm destroyed more than 2,100 homes statewide and damaged another 2,000. “As time goes on we’re struggling to get through the after effects of what took place in the flood,” John Wyatt, a pastor from Rainelle, told West Virginia Public Broadcasting. He’s still rebuilding his own home. On Friday evening, West Virginia Gov. Jim Justice planned to join a candlelight service at Rainelle United Methodist Church in one of his state’s worst-hit flood areas of 2016. Five people in that Appalachian town of 1,500 died in the disaster that piled up water, mud and debris in homes, businesses and streets. With Cindy’s remnants a threat over a huge area, many just hoped severe weather would pass them without harm. “We should have a comfortable weekend coming up if we can just get through tonight and tomorrow,” said Greg Meffert, lead forecaster in the Paducah, Kentucky, weather service office. The U.S. Storm Prediction Center said severe storms pose a lingering threat from the Southeast into western Pennsylvania. Even Indiana in the Midwest felt the impact of Cindy, which sprang Tuesday from the Gulf of Mexico as a tropical storm before roughing up the Deep South and making landfall Thursday. It has since weakened to a depression while heading far inland. Heavy rainfall associated with remnants of the storm caused scattered street flooding across central and southern Indiana on Friday. Weather service flood warnings covered most of the southern two-thirds of the state, with more than 3 inches of rainfall having accumulated in some places by midday – and minor flooding expected along some Indiana rivers. Emergency crews helped some people from stranded vehicles in Muncie, Indiana, including a nearly submerged SUV at a railroad underpass. Low-lying roads in many areas were covered with water. Early Friday, high winds also peeled off part of the roof from a high school near South Bend, leaving 10 classrooms damaged. No injuries were reported. Cindy was blamed for one death: Nolan McCabe, 10, of St. Louis, Missouri, was vacationing with family on the Alabama coast when he was hit by a log carried in on a big wave. Cindy also caused widespread coastal highway and several short-lived tornadoes. In Alabama, the weather service said, an EF-2 twister with winds up to 120 mph struck just outside Birmingham Thursday. Several businesses were damaged and at least four people were hurt. In Tennessee, Memphis Light Gas and Water reported that as many as 10,000 customers were without power Friday morning, amid local reports of heavy rain, gusting winds and some morning traffic snarls. “I had heard Tropical Storm Cindy mentioned,” Clewley said. But she saw no damage in her neighborhood and thought hype in advance was due to officials feeling it was better people were overprepared than underprepared. “And, ratings are good,” Clewley added of the local TV news outlets. Published: June 23, 2017, 12:02 p.m. Updated: June 23, 2017, 3:09 p.m.